HyperDeck Shuttle records to uncompressed QuickTime and compressed Apple ProRes 422 (HQ) or Avid DNxHD MXF file formats. Bypass your cameras compression and record from SDI and HDMI onto low cost solid state disks. SSDs are cheap and fast, so you can edit directly from the SSD media itself! HyperDeck Shuttle Mounting Plate has been designed to provide you with an extremely versatile and flexible mounting solution for your HyperDeck Shuttle. Now you can easily secure your HyperDeck Shuttle to a camera rig with your choice of rail mounts, cold shoe mounts, articulated arms and a whole lot more. You can also power your HyperDeck Shuttle from an external battery by simply attaching a V-Mount or Anton Bauer style battery plate and youre good to go. HyperDeck Shuttle captures the world's most popular video files in native uncompressed 10-bit QuickTime and compressed Apple ProRes 422 (HQ) or Avid DNxHD MXF files. Recording straight to ProRes or DNxHD is perfect for working with the full Avid Media Composer family of software including NewsCutter and Symphony. There is no need to reformat or transcode your files, so you get the most efficient Avid workflow. DNxHD files can easily be graded natively with DaVinci Resolve using full AAF roundtrip with Media Composer. HyperDeck Shuttle also records direct to mathematically perfect quality uncompressed 10-bit QuickTime files that can be used with all popular video software like Final Cut Pro, Premiere Pro CC, After Effects CC, DaVinci Resolve and more! With a compact and incredibly sturdy design, HyperDeck Shuttle is machined out of a solid block of aircraft grade aluminum! That means you get a design with the strength to go anywhere! Take your HyperDeck Shuttle into the field, on set, to live events, or even on your extreme sport shoots. With an internal battery, just recharge and go! The possibilities are virtually endless! Theres no need to haul around a computer because the lightweight HyperDeck Shuttle does it all, yet fits easily in your backpack! You can even add HyperDeck Shuttle to your tripod along with your camera! Simply plug a 2.5 solid state disk into HyperDeck Shuttle and you get video recording with blazing fast speed, low power consumption and totally silent operation. Now you can eliminate complicated and expensive disk arrays. A single SSD can record either compressed or uncompressed video effortlessly! Removable media like CF and SxS cards simply cannot match that kind of performance and require slow file copying to use. With no moving parts, SSDs are extremely robust and you can edit direct from the disk. 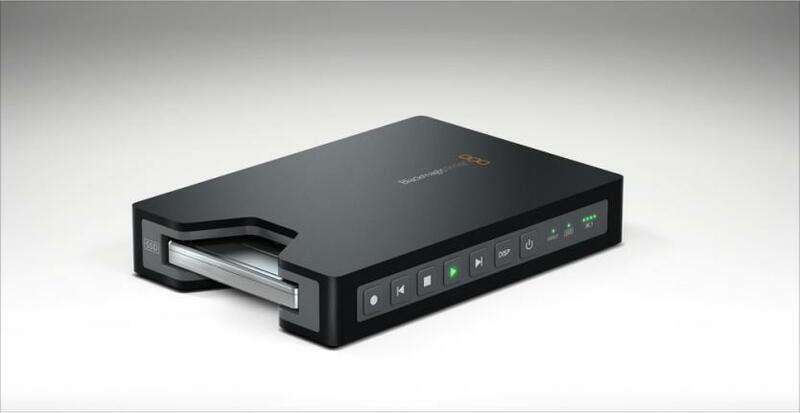 Only SSDs can easily handle shocks and vibrations that would destroy conventional hard drives or videotapes.